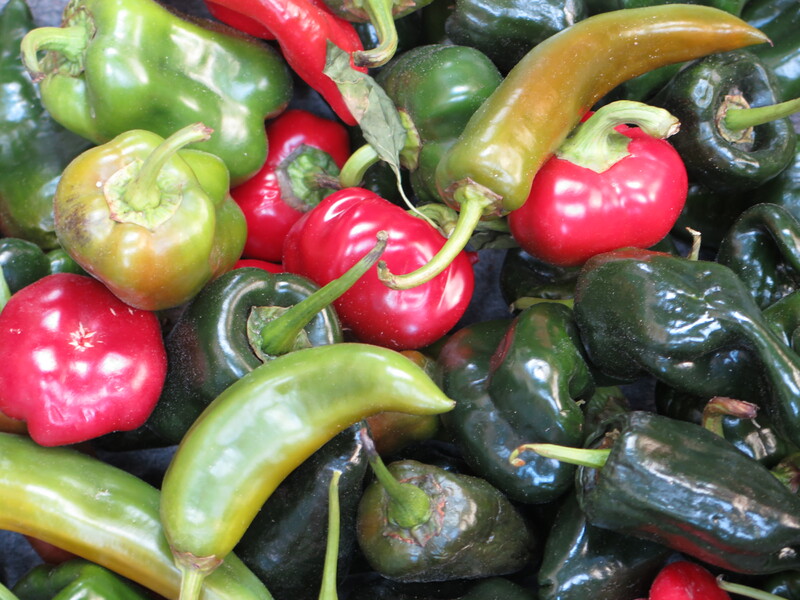 We gleaned the last of the peppers last week before John pulled the tomato and peppers stakes to till the fields. Putting the beds to rest marks the end of another Stonebridge season, one lengthened by unusually warm fall weather this year. But what’s “usual” about weather anymore? 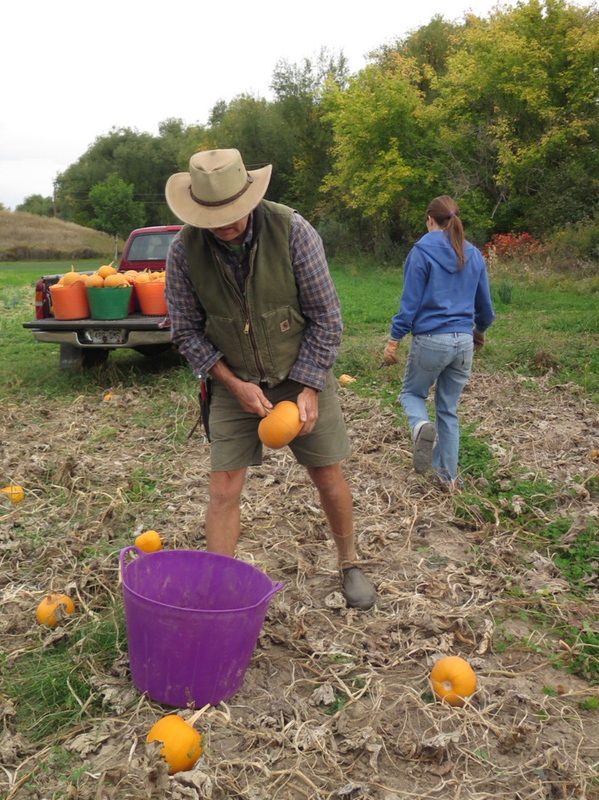 The first hard frost fell just before Halloween and after the last Saturday pick for our CSA members. We’ve given tomatoes on the final Saturday before, but always green tomatoes ripened in the greenhouse, not from vines in the field. I traveled a bit this fall, teaching, lecturing, and reading from my book, A Bushel’s Worth: An Ecobiography. Each time I left the farm, I missed another turn toward fall, returning to trees more golden than just days before. 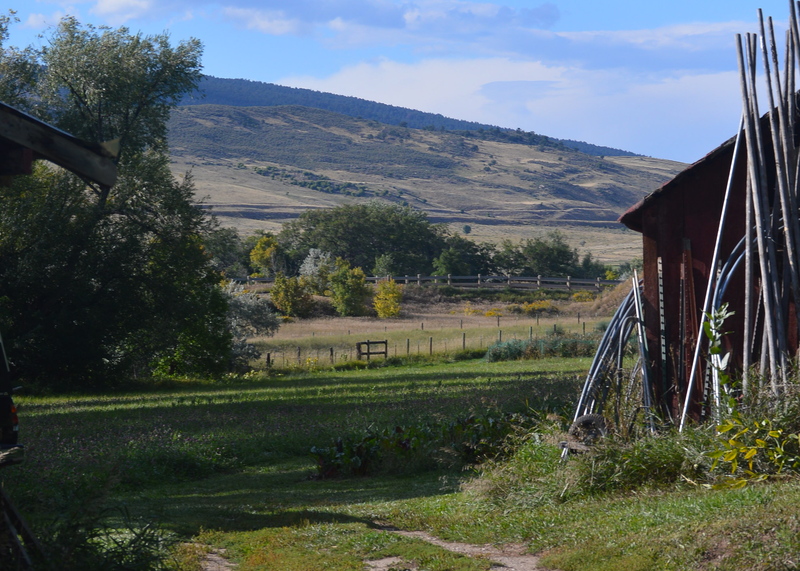 On my return, we slowly emptied the fields of their crops, until only hardy greens like kale and spinach and roots like carrots and rutabagas remained in the warmth of the autumn sun. 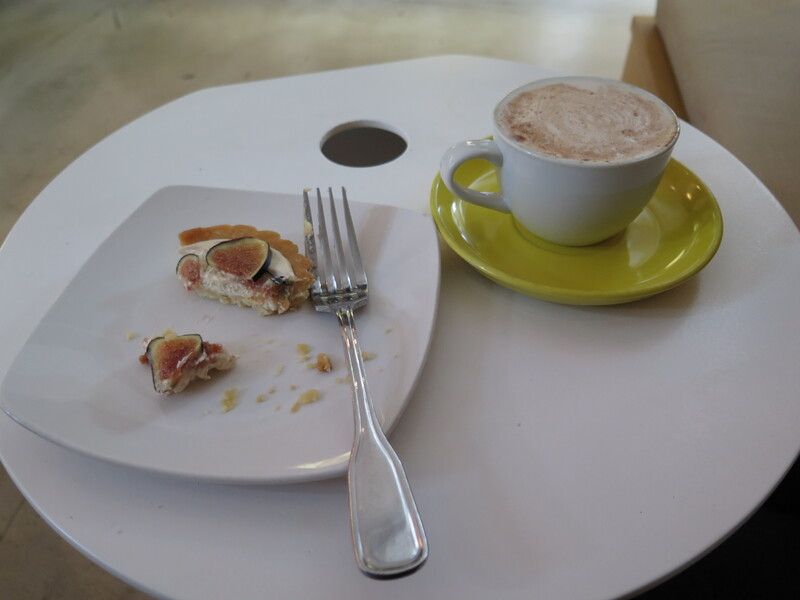 When I travel, I always pay attention to food, searching for meals that offer something delicious and new. I want to experience food in a way I haven’t before. Sometimes, I research restaurants before I go; other times, I depend on serendipity to draw me toward a grand discovery. I traveled this way for decades before I realized that food is one of the markers by which I create, appreciate, and remember my journeys. My sister traveled with me to Oregon this year. 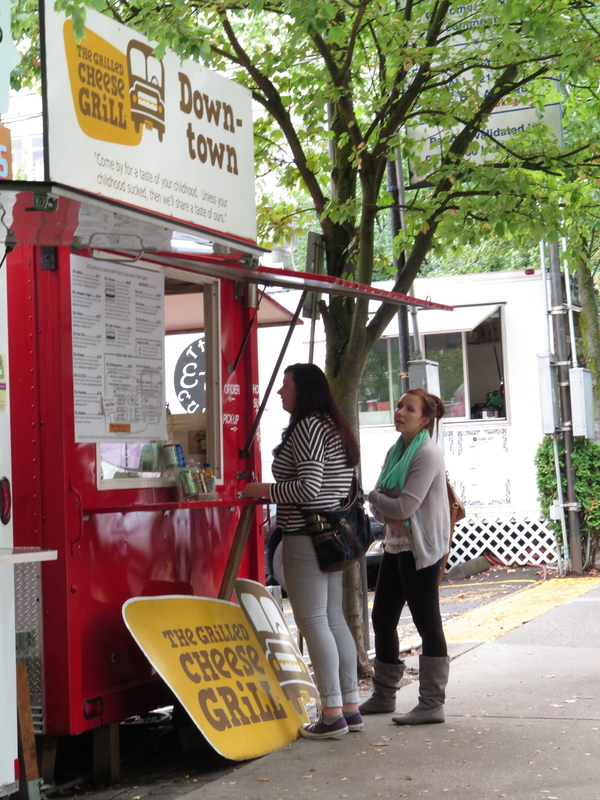 Our first meal was from one of the fun food carts that circle an entire city block. 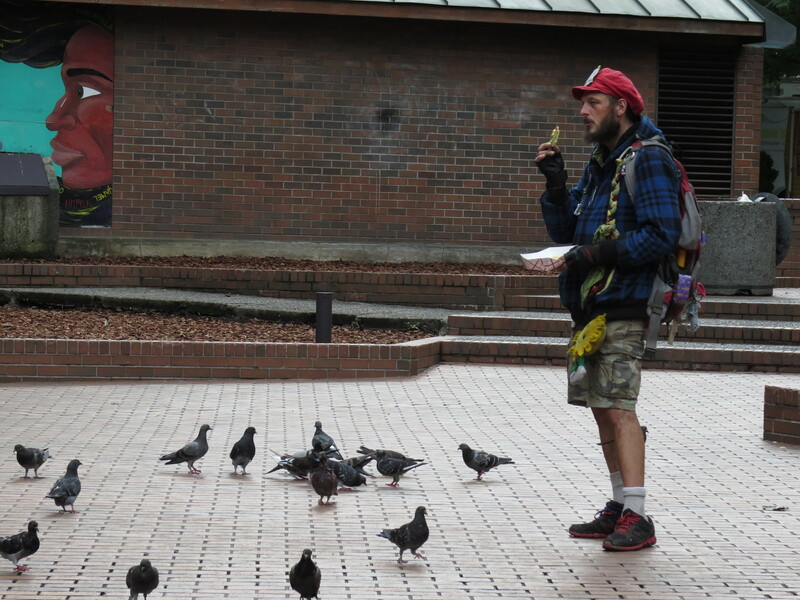 Here’s a photo story of my grilled veggie and cheese sandwich–and a local resident sharing the last of it with his flock of friends. 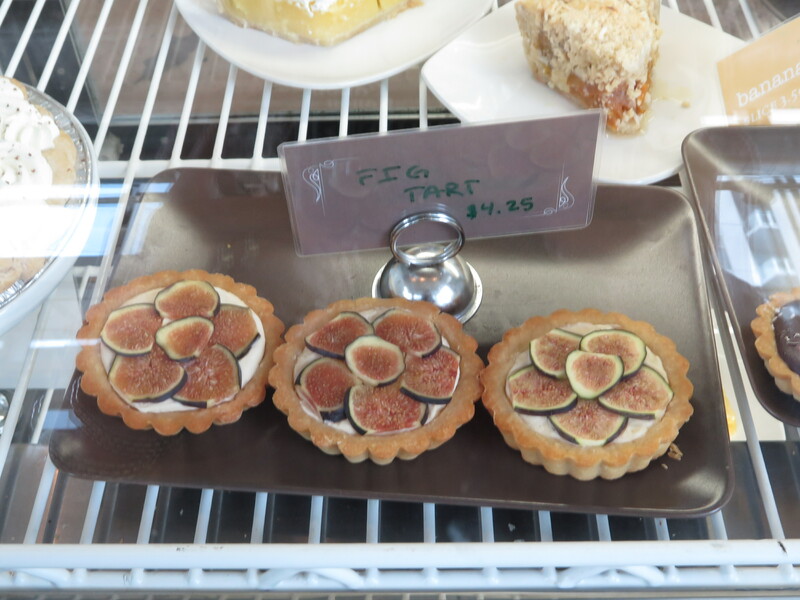 And here’s an exquisite fig tart with chai tea. You can see how much I enjoyed it. 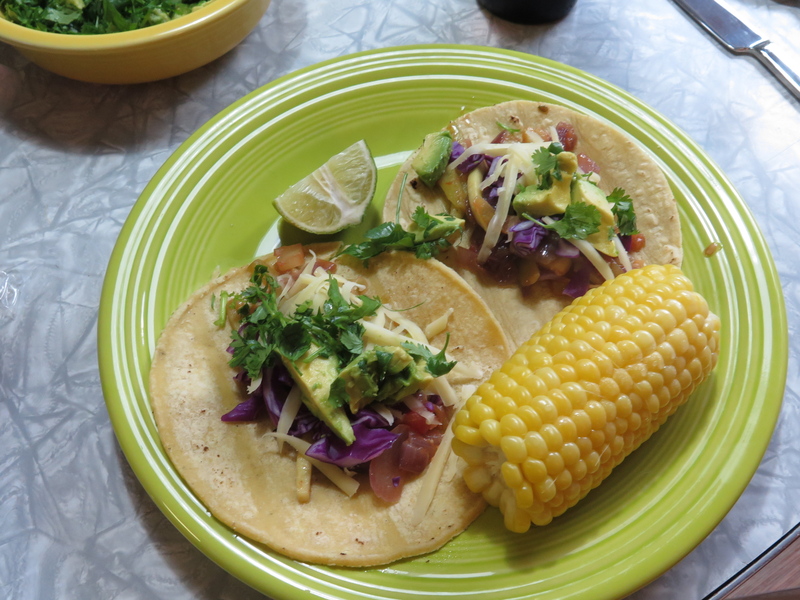 On the Oregon coast, my sister and I collaborated on sautéed zucchini & cabbage tacos with fresh salsa and avocado, along with corn on the cob bought just that morning by my mother-in-law at a local farmer’s market. 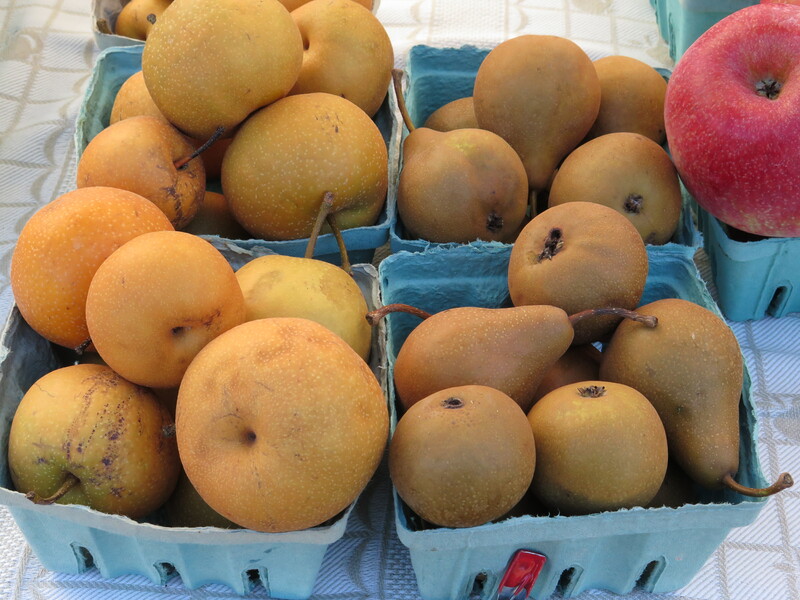 We visited other farmer’s markets along the coast, finding gorgeous Asian pears, gluten-free bread and cookies, and locally caught and canned tuna. 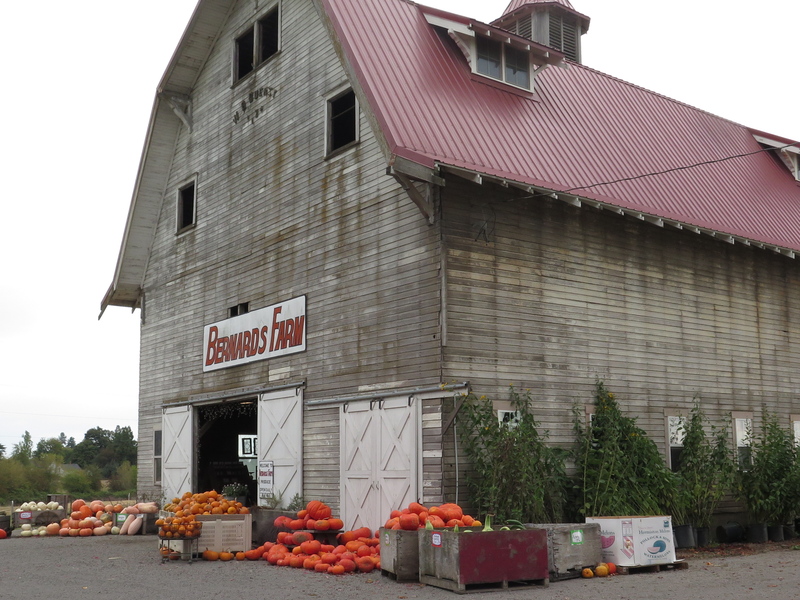 On our trip back to Portland, we stopped at our favorite farm in the valley, where we bought hazelnuts to take home. Back in Portland, we dined at Prasad, a vegan restaurant in the revitalized Pearl district. 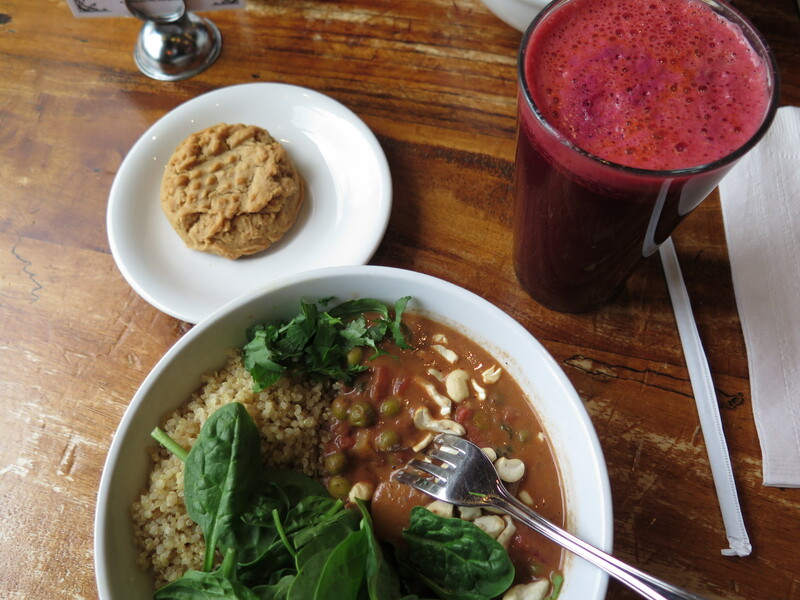 I loved the fresh spinach and cilantro topping our “Brahma Bowl” of garam masala veggies and quinoa; the color of the “Rising” beet/carrot/apple/ginger juice; and, of course, the vegan peanut butter cookie! I don’t have any food pics for Golden, site of Women Writing the West’s 20th anniversary conference, but I particularly enjoyed the roasted and stacked mushrooms, red peppers, and squash with teriyaki marinade. Ordering vegetarian at a conference is always interesting—if not risky—but this dish was colorful and tasty, too. Of great loss to Golden is the closing of Golden Natural Foods. After 30-some years of business, the shop is closing its doors. I’m glad I got to visit one last time. In Salt Lake City, I spoke and read at a Slow Food event as part of Utah’s Book Festival. With a mission of “good, clean, and fair food for everyone,” it’s no surprise Slow Food members throw a great potluck! My only disappointment was being too busy to eat more of it. Highlights were the beautiful roasted beet soup donated by Urban Pioneer Foods; beet cashew butter on delicious crusty bread; arugula, cabbage, and orange salad braided on a plate rather than tossed in a bowl; and zucchini-packed bar cookies as one of many wholesome desserts. Paying attention to food on my journeys–especially dishes that highlight local cuisines and produce—helps me learn about a region’s people, cultures, and history. Searching out “food hubs” like Portland’s carts, small-town farmer’s markets, and Slow Food gatherings teaches me how local folks create both food traditions and innovations, two sides of the same impulse toward re-centering delicious, safe, and nutritious food in our lives. Back at Stonebridge, we ate the last of the gleaned jimmie nardellos, stuffed with Manchego cheese and roasted in the oven for a half or so at 375º. 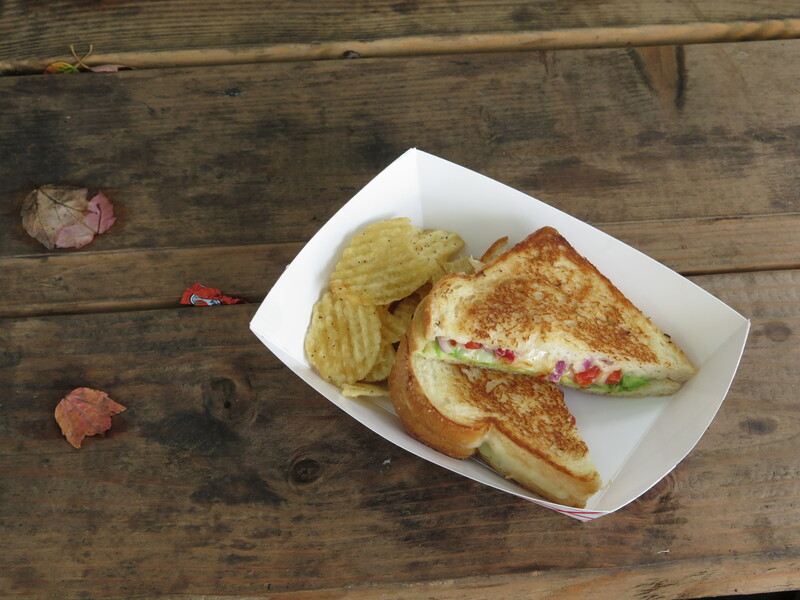 My very last bite paired browned salty cheese with softened sweet red pepper, the finale to an amazing 23rd season. Soon we’ll dig the last of the leeks, carrots, and other roots for our Thanksgiving shares, to accompany butternut squash, pie pumpkin, onions, garlic, and potatoes. 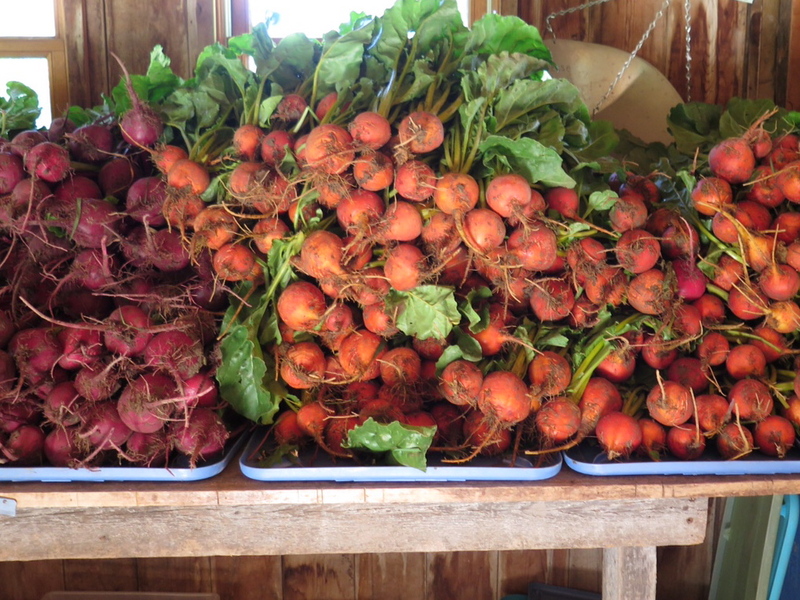 After the fields are cleared, we’ll eat from the greenhouse, barn, and freezer. 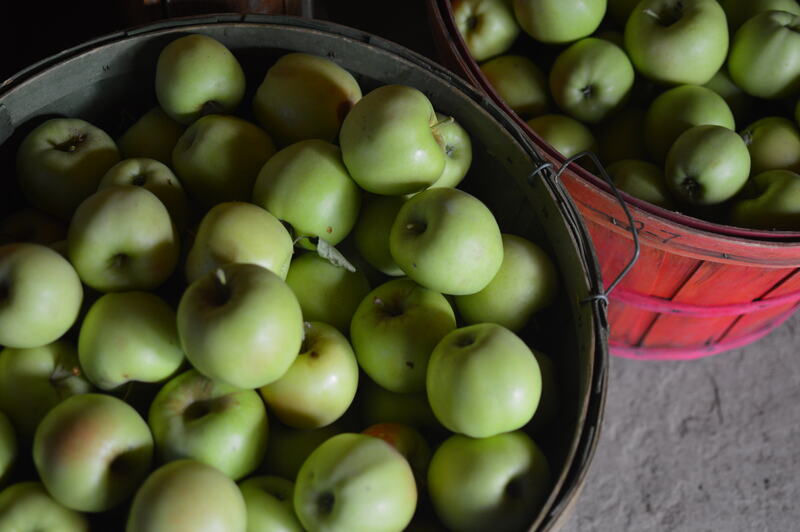 As we say farewell to this year’s abundance of fresh vegetables, we’ll give thanks for another season on the land. We have other good-byes to make soon—losses that aren’t as easy as the tilling of fields. As the season draws toward its inevitable end, we’re reminded to glean what we can, while we can, from experiences, relationships, and connections with each other and the earth. Perhaps farming helps us understand that bounty and loss travel together, leading by turn on this journey called life. John and I ate at a new Boulder café recently, one with a cute name and homey décor. I liked the selections of fresh vegetables (including peas with a creamy basil sauce), but I was put off by how the menu was meat-laden in disingenuous ways. For most of the dishes, “protein” choices were listed as extra options—except they were all animal meat products. When I asked whether the cafe carried any non-meat proteins like tofu, the server said haughtily, “Oh, we don’t do any SOY products here.” As if SOY were a bad word. I know soy has problems, particularly of the genetically modified kind. To put U.S. agriculture into perspective, according to the latest USDA census just over 50% of ALL crops grown here are corn and soy. Just those two. And the vast majority of that production is genetically modified and used either for livestock feed or processed for products like high fructose corn syrup, corn sugar, sorbitol, soybean oil, and soy emulsifier, which doesn’t even sound appetizing. But organic soy for tofu is available and I imagine a Boulder restaurant would have access to that product (especially with the headquarters of White Wave organic tofu located in nearby Broomfield, CO). So in response to the “We don’t carry soy” announcement, I wanted to say, “But you do carry DEAD ANIMAL products.” Whatever. Why not just say MEAT? I understand dietary concerns about gluten and the imaginatively named “paleo” diet’s de-emphasis on grains, especially wheat, since what passes for wheat flour in this society isn’t anything like real food. However, I worry that the emphasis on meat over a variety of whole grains will prove costly to our health, as well as to the planet’s. Certainly, the over-emphasis on protein these days seems suspicious. Sadly, food has become a quagmire these days. We feel guilty for eating some things and get sick from eating others. We don’t know the growing and labor conditions of many of the foods we eat—and many of them are unrecognizable as food, anyway. That’s why I’m happy to grow vegetables, fruit, and herbs that can be used as close as possible to their natural, unprocessed forms. Like garlic. I spent a little time this afternoon choosing this Saturday’s share of garlic from the beautiful bulbs we’ve harvested the last couple weeks. We had some for lunch, in fact, sautéed with greens and sunflower seeds. Fresh garlic is hotter and juicier than aged garlic but its garlicky taste is milder, too. We love it as the preamble to all stir-fries and pasta toppings at Stonebridge. Garlic may not be high in protein, but each bulb has wonderful health benefits, is inexpensive, delicious, and easy to store. I’m willing to bet its carbon footprint is relatively low. Not to mention, garlic is simply beautiful! You just can’t get all that in a box or on a styrofoam tray. As lunchtime approaches for the Saturday crew picking CSA shares at Stonebridge Farm, our field talk turns to food. What to do with the lovely broccoli we’re harvesting; our favorite way to fix kale; our favorite meal from Stonebridge vegetables. For people who love food, chatting about what we like and how we’ll prepare it is almost as much fun as cooking and eating it. Reading Jam Today Too by Tod Davies (Exterminating Angel Press) is like sharing food stories with a friend across a big bowl of shelling peas. One recipe leads to another until, all of sudden, the bowl is full and so are we. Because food is connected to the people and places we love, talking about food feeds us, too. A sequel to her earlier Jam Today, JTT includes recipes for disasters, grief, home, friends, feasts, and even eating alone. Each chapter serves up new ideas for how to make the most of ingredients on hand. In the grab-and-go cuisine of the US today, food doesn’t seem to count for much. But a counter-movement (or would that be an anti-counter movement, in the case of fast food restaurants where meals are transacted at the counter?) that places food at the center of our lives reminds us to pay attention not only to what we eat, but to how. How do the food choices we make connect us to the health and well-being of our bodies and to the environment upon which we depend? The subtitle of Jam Today Too is “The Revolution Will Not Be Catered.” By this Davies means that no one should expect to be served by others but rather that we all should pay attention to the ways we can help each other be well. As a farmer, I agree. Safe, nutritious and delicious food should not be the privilege of the affluent in some hyper-individualist ethos, but rather the right of all through community cooperation. And what need is more commonplace than the growing, preparing, and eating of food? Jam Today Too is an antidote to the industrial food lobby’s portrayal of food as inconvenient, irrelevant, and even harmful. Davies’ book reminds us that real food–the kind that nourishes both body and soul—is found in the simplest meals made with love.